The rhizome of Atractylodes lancea (Thunb.) DC or A. chinensis (DC.) Koidz. of family Compositae. The former is mainly produced in Jiangsu, Hubei and Henan provinces, etc. in China, the later in Inner Mongolia Autonomous Region, Shanxi and Liaoning provinces, etc. in China. The former is specially fragrant, slightly sweet, pungent and bitter in flavor, the latter is slightly fragrant, pungent, and bitter in flavor. The best one of the former is big, massiness, fragrant, without fibre and with red spot. After cut into segment, there is white frost on cross section. The best one of the latter is big, massiness, fragrant and without fibre. 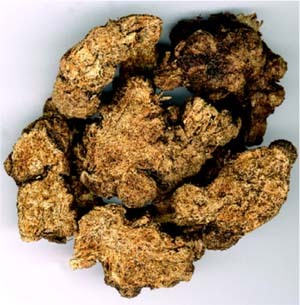 Dried in the sun, unprocessed or stir-baked with bran or water in which rice has been washed. Pungent, bitter, warm; spleen, lung and liver meridians entered. Dry dampness and invigorate spleen, dispel wind-dampness, release exterior. It can dispel damp-turbidity by drying dampness with bitter-warm, harmonize spleen-stomach by invigorating spleen with pungent-fragrant. It is most suitable for the dysfunction of spleen in transformation and transportation due to damp obstruction of middle energizer manifested as gastric and abdominal distention and fullness, nausea, poor appetite, vomiting, diarrhea, fatigue and white greasy tongue coating. It is usually combined with the damp-drying, middle-energizer-harmonizing and qi-moving herbs. For instance it is combined with Hou Po and Chen Pi in Ping Wei San from Tai Ping Hui Min He Ji Ju Fang. 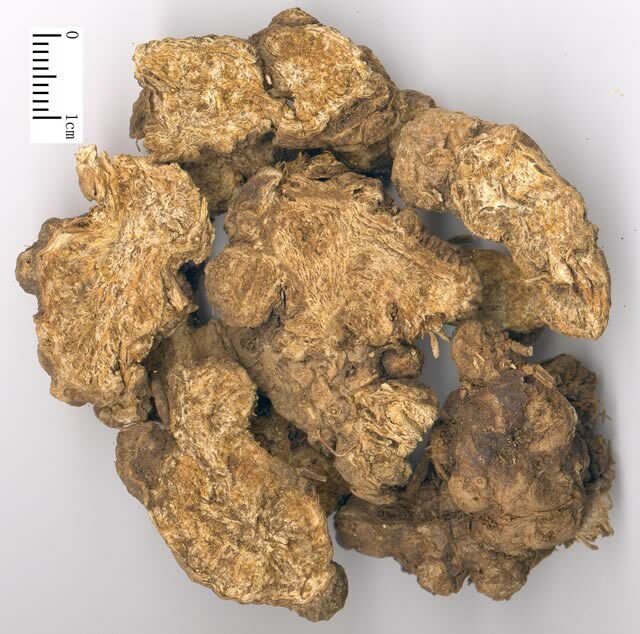 It is pungent, bitter and dry in property, and good at dispelling dampness, so it is suitable for arthralgia with damp excess. It is usually combined with the wind-damp-dispelling herbs. For instance it is combined with Yi Yi Ren and Du Huo in Yi Yi Ren Tang from Lei Zheng Zhi Cai (Classified Treatment). For damp-heat arthralgia, it is usually combined with the heat-clearing and fire-purging herbs. For instance it is combined with Shi Gao and Zhi Mu in Bai Hu Cang Zhu Tang from Pu Ji Ben Shi Fang (Universal Relieving Experiential Prescriptions). For damp-heat atrophy-flaccidity, it can be combined with the damp-heat-clearing and tendon-bone-strengthening herbs. For instance it is combined with Huang Bai, Yi Yi Ren and Niu Xi in Si Miao San from Cheng Fang Bian Du. It is most suitable for exterior syndrome of wind-cold type complicated with dampness. The reason covers three aspects: it is pungent, fragrant and dry in property; it can induce sweating and disperse the exogenous wind-cold from superficies; it is good at removing dampness. It is usually combined with the cold-dispersing and exterior-releasing herbs such as Qiang Huo, Bai Zhi and Fang Feng. In addition, it can brighten the eyes and is indicated for night blindness, blurred vision and eye dryness for the actions of drying dampness and invigorating spleen, and elevating clear yang to nourish eyes. It can be used alone, cooked with liver of sheep or pig or combined with Shi jue Ming, etc.